Thanksgiving is unreservedly family time for us with a huge feast ensemble together by our extended family. Kids look forward for this special occasion to see their cousins and besides all it’s a long weekend, what else you need? Each year my brother comes up with different recipe for turkey as the party will be hosted at their house. Last year it was Martha Stewart’s recipe and the turkey was awesome. He was giving us (me, my S-I-L and my Mom) special instructions how to do it like a pro chef (that is what he think during Thanksgiving). It got out of control when he tried to flip the turkey and I still remember we had to run for his rescue :). Yeah, it’s lot of fun when you try to cook together with your family. As he and my hubby tackles the turkey and chicken problem, we ladies gets busy with preparing the stuffing and all other sides that accompanies the feast. It will be a gathering of at least 40 people, so we have lots of food prepared by all the cousins and family. Out of the entire feast, I love the chicken my Uncle (Mom's sister's husband) makes, he uses some top secret special seasoning and it always top all entries and sure is lip smacking. Anyhow, it is the time of total merriment with the family. 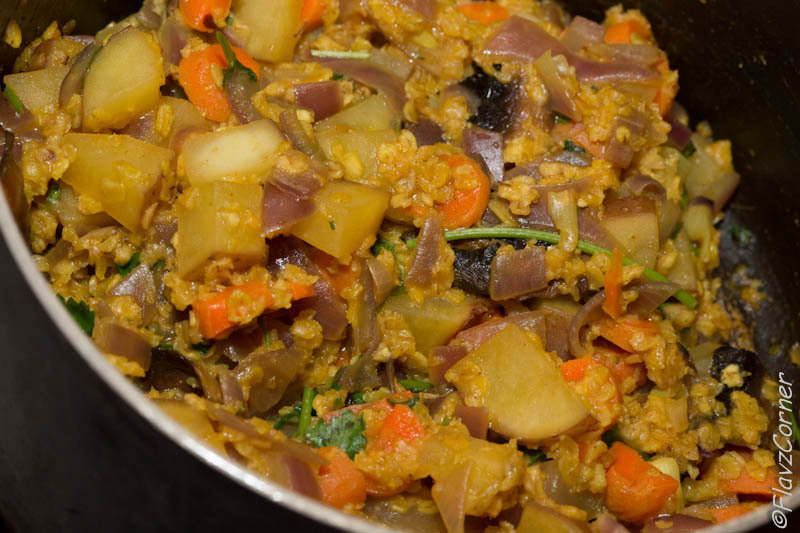 Here is the Indian Tandoori style recipe I made couple of days ago and my whole family loved it. The chicken was very moist and was infused with proper balance of spices. When I got it out of the oven and set it up for my pictures, kids were getting impatient and wanted to dig in so bad. 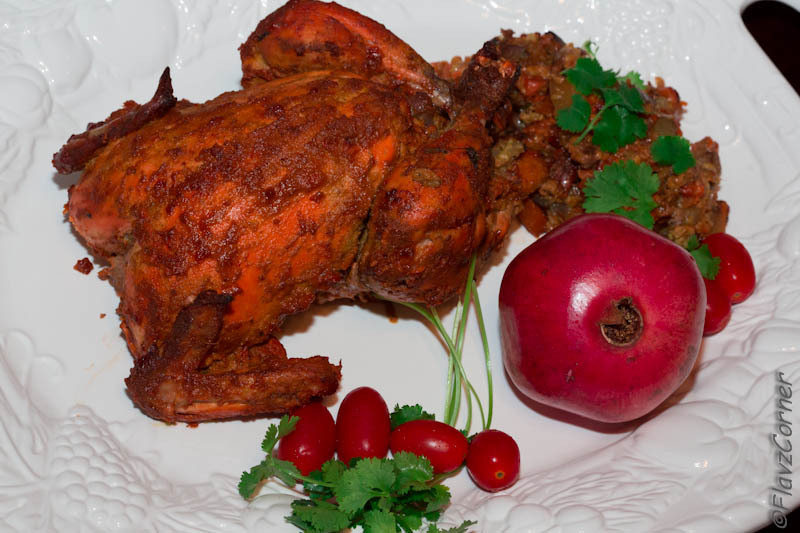 Give this recipe a try if you are planning to make Indian style chicken for thanksgiving. Keep the cleaned chicken in a strainer to drain all the water. Pat dry the chicken. Blend all the ingredients for marinade. Check the salt. Take 1/4 cup of the marinade and reserve for later use. Rub the marinade on the chicken. Apply the marinade inside the chicken too. Use a wooden skewer to poke on the fleshy parts of chicken and pour rest of the marinade over chicken and marinate for at least 8 hrs or overnight. Heat a non-stick pan with 1 tsp of oil and roast the garlic. Add ginger, onion and turmeric and cook till the raw smell is gone. Add carrots followed by potatoes and cook for 2 minutes. Take 2 tsp of the reserved marinade and add to the stuffing. Add the rolled oats and cook covered for couple of minutes. Pour in the stock and cook till the vegetables are all cooked well. Adjust the salt and pepper according to your taste. Take the chicken out of refrigerator and transfer to the baking pan. Stuff the chicken with the prepared stuffing and tie the legs of the chicken with a twine or un-waxed floss. Brush the chicken with the marinade that is drained into the bowl. Spray some cooking oil or baste 1 tsp of oil on the chicken. Cover with an aluminum foil and cook for 1 hr at 350 F.
After 1 hr, take the chicken out, baste the chicken again with rest of the marinade that was reserved. Increase the temperature to 375 and cook the chicken uncovered for another 1/2 hr or till the inside of the chicken is no longer pink. Take the chicken out and cover with aluminum foil and leave it for 10 minutes. Enjoy the chicken while it is warm. I make extra stuffing and keep it outside the chicken in the same pan of chicken while baking. This helps the stuffing to cook in the juice of chicken and keeps it moist. Make sure you increase the temperature after 1 hr and uncover and cook, so that all the juice dries up. look at the color, beautifull!! !